His bronze plaque dedicated in 1956 at the National Baseball Hall of Fame and Museum in Cooperstown, New York, begins: "One of baseball's greatest right-handed hitters." Hank Greenberg starred as the Detroit Tigers' first baseman-outfielder from 1933 to 1946 (in military service from 1941 to 1945), finishing his active career in 1947 with the Pittsburgh Pirates. Greenberg was the American League’s Most Valuable Player twice, at two different positions––first base in 1935 and outfield in 1940. He won the American League Home Run Championship four times—1935 (tied), 1938, 1940, and 1946—hitting 331 career major league homers, including 11 grand slams. He holds the Major League single season record of most games with two or more home runs in a game—11 in 1938. That same year he tied two Major League single season marks: most home runs by a right-handed batter, 58 (only Babe Ruth and Jimmie Foxx hit as many or more), and hitting four homers on consecutive appearances in two games. "Hammerin' Hank" had a lifetime batting average of .313, and 1,276 career runs-batted-in (RBIs), including an American League-leading 139 in 1934, 170 in 1935, 183 in 1937, 150 in 1940, and 127 in 1946. Seven times he drove in more than 100 runs in a season. His statistics are all the more startling when compared to the diminished number of games played in his career—1,394. Greenberg played only 12 games in 1936 (the year following his first MVP award) and went into the U.S. Air Corps just 19 games into the 1941 season (following his second MVP year). He was the first American League player to enlist for military duty in World War II, and by doing so gave four of his prime playing years to the war effort. 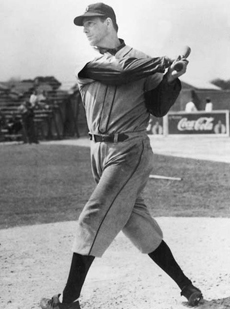 Greenberg did not return to baseball until July 1945. Picking up where he had left off, his big bat carried Detroit into the ’45 World Series against the Chicago Cubs. It was “Hammerin’ Hank’s” ninth-inning grand slam homerun on the last day of the season that won the 1945 AL pennant for the Tigers. Greenberg also played in four World Series for Detroit, batting .318, hitting five home runs and 22 RBIs in 23 games. Already en route to becoming a baseball legend during his second big league season in 1934—he would finish the year with a .339 batting average, 139 RBIs, and lead the league in doubles—Greenberg became an indelible signature in both Jewish and baseball folklore. With Rosh Hashanah approaching and the Tigers moving closer to their first American League pennant in 25 years, fans, rabbis, and the media were caught up in a controversy concerning whether or not Greenberg should play in a game scheduled on Rosh Hashanah—the Jewish New Year. After considerable soul-searching, Greenberg played on the holiday, hitting two home runs in a Detroit victory. However, there was also a crucial game scheduled a week later on Yom Kippur, the holiest day of the Jewish year. Greenberg did not play in that game, opting to spend the holy days in a synagogue, and the Tigers lost. Nonetheless, the Tigers won the pennant, and Greenberg won the respect of his peers, the fans of baseball, and the general public who followed his front-page story. 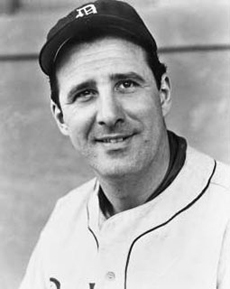 Greenberg was selected to four consecutive All Star teams from 1937 to 1940. He was elected to the Baseball Hall of Fame in 1956.